OnStage Media, LLC, d/b/a OnStage Magazine (onstagemagazine.com) is not affiliated with or endorsed by any artist, venue or box office. 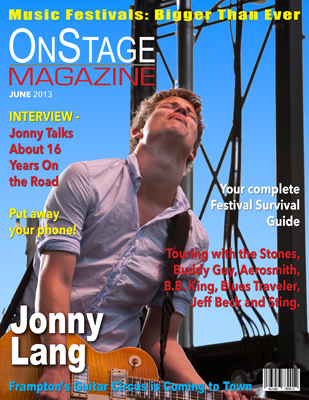 By clicking through to any articles, images, icons, or other items posted on this Web site (“onstagemagazine.com”), You are agreeing to the following Terms and Conditions. 1. Agreement Between You and the owners and operators of this Web site (hereafter “Operators”). The following terms and conditions (the “Terms and Conditions”) apply to all visitors to, or users of, this Web site. By accessing this Web site, You acknowledge acceptance of these Terms and Conditions. In the case of any violation of these Terms and Conditions, the Operators reserve the right to seek all remedies available by law and in equity for such violations. The Operators acknowledge that there are other available Web sites that offer comparable products and services. In that regard, the Operators acknowledge that You have almost unlimited choices in selecting a Web site to accommodate Your needs, and that Your selection of this Web site is completely voluntary. In that regard, You agree, by entering into this Agreement, that You will be strictly bound to all of the terms and conditions and use of materials as set forth herein. Any User Content that you post, transmit, or otherwise make available for viewing on public areas of the Site, including but not limited to comments and messages posted in response to our news articles (collectively, “User Content”), Author, Contributor, or Editor content that you post, transmit, upload, publish or otherwise make available to viewers of this site, including but not limited to posts, galleries, photographs, sound recordings and articles or responses to content (collectively, “Content”), will be treated as non-confidential and non-proprietary to you. You understand and agree that any such Content may be used by the Site or our affiliates, without review or approval by you, for any purpose whatsoever, including for the use in generating revenue, and in any medium, including our print media. You grant the Site (and our affiliates) the irrevocable right to use and/or edit your Content, without review or approval by you, for any purpose whatsoever, including, without limitation, reproduction, disclosure, transmission, publication, broadcast, posting, and advertising in any media in perpetuity without notice or compensation to you. All materials on the Site, including without limitation, logos, images, text, illustrations, audio and video files are protected by copyrights, trademarks, service marks, or other proprietary rights which are either owned by or licensed to the Site or owned by other parties who have posted on the Site. Materials from the Site and from any other web site owned, operated, controlled, or licensed by the Site may not be copied, reproduced, republished, uploaded, posted, transmitted, or distributed in any way. In posting content on the Site, you grant the Site, and its owners and licensees, the right to use, reproduce, distribute, translate, modify, adapt, publicly perform, publicly display, archive and create derivative works from the posted content. 2. Intellectual Property Protection. The Operators have made good faith efforts to avoid infringing any intellectual property rights of others. For example, the use of any image or other material on this site is: (a) believed to be fair use; (b) properly licensed from the respective owners; or (c) from the public domain. In the event that You are the owner (or the representative of the owner) of the allegedly-infringed intellectual property: (a) You agree to follow the reporting procedures set forth herein; (b) You agree that the Operators’ prompt removal (within ten (10) business days) of the allegedly-infringing materials from the Web site will constitute a complete and final remedy of any alleged harm; and (c) You fully release the Operators from any liability with reference to the allegedly-infringing materials. 3. General Use Provisions and Copyright. You acknowledge that the Operators have spent valuable time and effort in developing this Web site. Thus, all materials provided on this Web site, including but not limited to all text, logos, designs, graphics, images, sounds, information, software, documents, products and services (collectively, the “Materials”), and the selection, arrangement and display thereof, are the copyrighted works of the Operators. All Materials herein and all software are proprietary to the Operators and protected by worldwide copyright and other intellectual property laws. Except as stated herein, none of the Materials may be modified, copied, reproduced, distributed, republished, downloaded, displayed, sold, compiled, posted, or transmitted in any form or by any means, including but not limited to electronic, mechanical, photocopying, recording, or other means, without the prior express written permission of the Operators. 4. Limited License. The Operators appreciate the opportunity to enter into this Agreement with You. Thus, as part of the Agreement, the Operators hereby authorize You to view the materials available on this web site. Except as expressly provided above, nothing contained herein shall be construed as conferring, by implications, estoppel, or otherwise, any license or right under any patent, trademark, or copyright of the Operators. 5. Trademarks. You acknowledge that the Operators and/or other third parties have made considerable efforts to increase the visibility, and therefore the value, of its trademarks, trade names, and service marks (the “Marks”). As such, the Marks displayed on this Web site are the property of the Operators and/or other third parties. Users are not permitted to copy or otherwise use these Marks without the prior written consent of the Operators and/or such third party which may own the Mark. 6. Compliance with Laws, Export Controls. You acknowledge that the software and any accompanying documentation and/or technical information is subject to applicable export control laws and regulations of the United States of America. You agree not to export or re-export the software, directly or indirectly, to any countries that are subject to U.S. export restrictions. 7. Devices. You acknowledge that the Operators have spent considerable time and money in providing these Materials to You and various other individuals. Thus, you acknowledge that the Operators have an interest in maintaining a relatively responsive and reliable Web site. As such, You agree that You will not use any robot, spider, other automatic device, or manual process to monitor or copy our Web pages or the content contained herein without the prior expressed written permission of the Operators. You agree that You will not use any device, software, or routine to interfere or attempt to interfere with the proper working of this Web site or any listing, offer, or transaction being conducted on this Web site. You agree that You will not take any action that imposes an unreasonable or disproportionately large load on the infrastructure of this Web site. 8. No Unlawful or Prohibited Use. As a condition of Your use of this Web site, You warrant to the Operators that You will comply with all applicable laws, statutes, ordinances, and regulations regarding Your use of the service on this Web site and any related activities associated with this Web site. In addition, You warrant that You will not use this Web site in any way prohibited by these Terms and Conditions. 9. Links to Third-Party Web Sites. In an effort to provide better service to You, the Operators may provide links to Web sites operated by parties other than the Operators. Such hyperlinks are provided for reference only. You acknowledge that the Operators do not control such Web sites and are not responsible for their contents. The inclusion of hyperlinks to such Web sites does not imply any endorsement of the material on such Web sites or any association with their operators. If You decide to access any of the third-party sites linked to this Web site, You do so entirely at Your own risk. 10. General Disclaimer. Although the Operators have attempted to provide accurate information on the Web site, the Operators assume no responsibility for the accuracy of the information. All information provided on this Web site is provided “as is” with all faults without warranty of any kind, either express or implied. The Operators hereby disclaim all warranties, express or implied, including, without limitation, those of merchantability, fitness for a particular purpose, title and non-infringement or arising from a course of dealing, usage or trade practice, except to the extent such disclaimers are held to be legally invalid. 11. Limitation on Liability. Neither the Operators nor any of their directors, members, managers, employees, agents, vendors, or suppliers will be liable for any direct, indirect, special, punitive, consequential, or incidental damages including, without limitation, lost profits or revenues, costs of replacement goods, loss or damage to data arising out of the use or inability to use this Web site or any services associated with this Web site, or damages from the use of or reliance on the information present on this Web site, even if the Operators have been advised of the possibility of such damages. To the extent that that You advise the Operators of any dissatisfaction with anything related to this Web site, You agree that You will do so according to the express procedure set forth herein. In return, the Operators shall attempt to reasonably cure such dissatisfaction. You agree that the Operators’ assessment of what would be a reasonable cure shall be binding, and You will not contest the Operators’ assessment. 12. Opportunity to Cure. Despite the express Limitation on Liability, as set forth herein, the Operators seeks to maintain good relations with those who use the Materials. However, the Operators have limited assets and limited capacity to address certain issues. Thus, due to such limitations, the Operators set forth the following procedures for reporting any dissatisfaction. You acknowledge that these procedures are reasonable, and that You will strictly adhere to these procedures for reporting any dissatisfaction with this Web site. Should there be any dissatisfaction with any of the services offered by the Operators, You agree to provide express written notice to the Operators, and provide the Operators the opportunity to cure or accommodate the alleged dissatisfaction within a three (3) month period. The three (3) month period shall begin from the date that the written notice is received by the Operators. Such written notice shall be emailed to notice@concerttour.org. The written notice shall begin with a subject line (or title), which recites, in all capital letters, “REPORTING OF DISSATISFACTION WITH onstagemagazine.com.” You agree to strictly follow these procedures for reporting any dissatisfaction, without any deviation, prior to commencing any other action, legal or equitable, against the Operators and/or any of the Operating Entities of this Web site. If You commence any action against the Operators and/or any of the Operating Entities prior to following these procedures, and prior to providing the Operators and/or the Operating Entities the opportunity to address any alleged dissatisfaction, then You agree to pay all costs associated with such action against the Operators and/or Operating Entities. Such costs shall include court fees, attorneys’ fees, filing fees, incidental costs, travel costs, lodging expenses, and any other costs, both foreseeable and unforeseeable, that are incurred by the Operators and/or Operating Entities in defending against such action. In other words, You acknowledge that the Operators and/or Operating Entities have limited resources, and, as such, You agree to incur any and all costs that are associated with defending any actions against the Operators and/or Operating Entities, whether initiated by You or by the Operators and/or Operating Entities. 13. Modification of the Web Site. The Operators (and/or its suppliers) reserves the right in its sole discretion to improve, modify, or remove any information or content appearing on the Web site. The Operators may discontinue or revise any or all aspects of the Web site in its sole discretion and without prior notice. 14. Modification of These Terms and Conditions. The Operators reserve the right to change at any time the terms, conditions, and notices under which this Web site is offered and/or operated. Modification of this contract will be deemed effective upon publication on the Web site. It is Your responsibility to check terms and conditions of this Agreement at the time of each use. 15. Severability. If any part of this agreement is determined to be invalid or unenforceable pursuant to applicable law including, but not limited to, the warranty disclaimers and liability limitations set forth above, then the invalid or unenforceable provision will be deemed superseded by a valid enforceable provision that most closely matches the intent of the original provision and the remainder of the agreement shall continue in effect. 16. Entire Agreement. This Agreement and all other agreements, exhibits, and schedules referred to in this Agreement constitute(s) the final, complete, and exclusive statement of the terms of the agreement between You and the Operators pertaining to the subject matter of this Agreement and supersedes all prior and contemporaneous understandings or agreements between You and the Operators. This Agreement may not be contradicted by evidence of any prior or contemporaneous statements or agreements. No party has been induced to enter into this Agreement by, nor is any party relying on, any representation, understanding, agreement, commitment, or warranty outside those expressly set forth in this Agreement. 17. Choice of Law and Choice of Forum. The final contents of this Web site are reviewed and approved by the Operators prior to being published on the Web site. While the articles and information on this Web site may be authored by one or more distinct individuals from different venues, the review and approval process, which accounts for a majority of the activities relating to the publishing of the articles or information on this Web site, takes place at the location of the Operators. Currently, that location is in Indianapolis, Indiana, Nashville, Tennessee, New York, NY, St. Johns, NewFoundland. Insofar as the bulk of the activities relating to the publication of the Web site occur in Indiana, You agree that this Agreement is governed by the laws of the State of Indiana, without regard to its conflicts of laws principles. You hereby consent to the exclusive jurisdiction and venue of courts in or nearest to the United States District Court for Southern Indiana, Indianapolis Division, in all disputes arising out of or relating to the use of this Web site. Use of this Web site is strictly prohibited in any jurisdiction that does not give effect to all provisions of these terms and conditions, including without limitation this paragraph. 18. Services Not Provided. In connection with Your use of this website and/or services, You acknowledge and agree as follows (a) the Operators are not responsible for the content of, nor do they endorse, the third-party websites to which You may link using this Web site; (b) the Operators do not guarantee the accuracy of any information available on this Web site, and are not responsible for any errors, omissions, or misrepresentations, and all information obtained on this Web site must be verified independently; (c) the Operators may make changes to its products and/or services and this Web site at any time and without notifying You or receiving Your consent; and (d) While the Operators comply with state and federal civil rights laws, the Operators do not monitor transmissions of information by others and thus assumes no liability for the failures of others to comply with such laws. 19. Contract Interpretation. Having fully read and understood this Agreement, You agree that any ambiguity in this Agreement shall be strictly construed in favor the Operators. Notices and counter-notices should be sent to Copyright Officer, copyright@onstagemagazine.com. There can be penalties for false claims under the DMCA. We suggest that you consult your legal advisor before filing a notice or counter-notice.